We are often asked, “where can I find inexpensive teacups? “ That is a great question. There are several resources that you might consider if you want to add to your teacup collection. Owning an assortment of affordable cups and saucers will come in handy for children’s tea parties, additional guests, gifts, picnics and more. Here are a few of our very favorite “go to” resources. Now they don’t sound like a specialist tea or china or porcelain company, do they? But with the online influence and effective ‘buying power’ that Amazon have, they can provide some truly competitive deals. Couple that with the fact that you can read what other people have said about the products they’ve purchased by way of Reviews, and you’ll have a pretty good idea of what to expect if you purchase a product from this heavyweight. Add to that the likelihood of qualifying for free postage, super-fast postage and great customer service (think : what will happen if you have a breakage during delivery?) and you’ll likely be very pleased with your inexpensive teacups purchase. Brew to a Tea have wonderful prices and ratings on their tea wares. On this particular setting, below, they have 4.9 out of a possible 5 star rating! I don’t think I’ve ever seen a better rating on a product! They’re obviously doing something right. If you are looking for British China then look no further than Magpie Marketing. While Magpie is essentially a wholesale company their purchase minimum is SUPER LOW so anyone can probably find a way to work with them. Here are a few examples of things they recently featured on their site. Recently brought to Tea Party Girl’s attention by a valued reader, The Teapot Shoppe is doing beautiful things out of Atlanta, Georgia. They are an online retailer, have a huge range, a heap of experience and supply not only traditional teapots and tea sets, but also children’s tea sets and tea cosies. They’re a great place to go for gift ideas. Ebay has long been a “go to” place for china. We have found many teacups on this site however, there is a key to saving money. Here it is! Always shop for teacup lots. You will not only save money on the cups and saucers you will also save money on shipping. Tea Party Girl (Sonya Michelle) is particularly fond of china trios (cup, saucer and plate) and collects them for her Tea Party Hire business! It’s not always a way to buy cheap tea cups, but sometimes gorgeousness is worth just a bit more! Tea Party Girl Asks: Where have you found teacups? Leave a comment and share your strategy! I have found some beautiful tea cups at Home Goods, and T. J. Maxx. And of course, at local flea markets and yard sales. Thanks so much for the tip about eBay! I have often looked there at single teacups but the price was just too high. Searching for teacup lots gave lists with much better prices. We would love to suggest Roses And Teacups Discount Teacups as well. Lots of beautiful inexpensive teacups for all occasions. 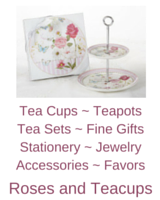 We have found some lovely items at TheTeapotShoppe.com for a reasonable price. Got a set for a tea party my daughter had. 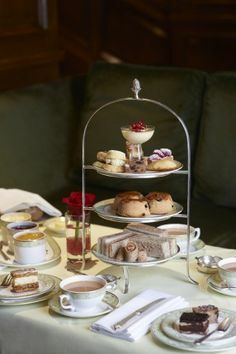 Hi my sister found a site called Cakestandland.co.uk She bought a lot of china tea trios from here and got it really quick and was very pleased with all of them.